Little Caesars Pizza franchisees often comment that they've enjoyed life experiences they never thought possible, thanks to their growth as a Little Caesars business owner. Our franchisees are excited about the benefits of being in business for themselves, but not by themselves. As the fastest growing carry-out pizza chain in America*, Little Caesars has been in business since 1959. Our philosophy is to provide customers with fresh, high quality products at a great value, with unmatched convenience. We currently have outstanding franchise opportunities in prime markets throughout the United States and around the world. Even with current economic pressures, Little Caesars is growing. Many of our franchisees feel the current economic climate provides the perfect opportunity to gain independence and go into business for themselves. “I chose to invest in Little Caesars because the brand is well positioned for growth since it offers consumers a great value at a time when they are really trying to find ways to save,”said Clif D’Mello, Little Caesars franchisee. To help our franchisees grow their business, we offer qualified franchisees territory reservation agreements, which are signed contracts that hold designated geographic areas for franchisees to expand their business over a predetermined period of time. Little Caesars also works with preferred lenders who understand the business, which becomes increasingly important as it gets more difficult for entrepreneurs to secure financing in today’s economy. Value is created by offering high quality pizza made with fresh ingredients for a great price. Little Caesars makes dough fresh in the stores, uses fresh, never-frozen cheese, and sauce made with vine-ripened tomatoes. We were recently named “Best Value in America” of all quick serve restaurant chains for the fifth year in a row**. Sandelman & Associates' Quick Track® research study tracks key consumer behavioral and attitudinal measures for all major fast-food chains. 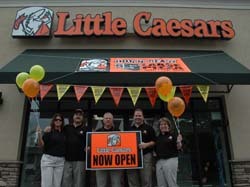 Little Caesars is the brand of choice for investors looking to expand their portfolios in today’s economy. Numerous business investors are seeing value in Little Caesars, including individuals experienced with other brands, people transitioning to a second career, investment companies and financial lenders. We are also attracting the attention of multi-brand franchisees with an appetite for business growth and opportunity. In fact, some multi-brand franchisees have found Little Caesars so rewarding that they have divested other interests to focus on their Little Caesars business. Little Caesars was listed by the Small Business Administration (SBA) as one of the best loan performers among franchises, with more than 60 SBA-guaranteed loans. (Reported in the Coleman Report, an annual compilation of performance data on thousands of SBA-guaranteed franchise loans). 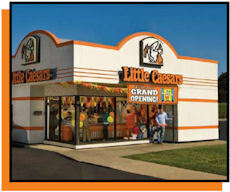 Little Caesars is a globally-recognized brand that supports franchisees with the tools of a proven system, including ongoing training, architectural and construction services to help with design, preferred lenders to assist with financing, the ongoing research and development of new products, and effective marketing programs. According to a survey conducted by Intellitrends, a leading international market research firm, 99 percent of Little Caesars franchisees surveyed agree that it has a proven system that works. 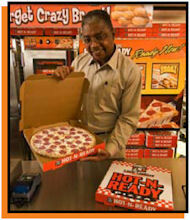 In addition, 98 percent of franchisees agree that Little Caesars is one of the hottest concepts in the pizza business. Working closely with its sister company, Blue Line Foodservice Distribution, Little Caesars leverages buying power to secure contracts to help minimize the impact of increasing costs. Little Caesars start-up costs are very competitive and fees associated with franchising the brand are modest. We require candidates desiring to open one store to have a net worth of $150,000 with a minimum of $50,000 in liquid, unencumbered assets (like cash). Franchisees must also be able to obtain financing to cover the total costs of opening a franchised location. The estimated initial investment required per franchise location ranges from approximately $194,250 to $622,500 for a standard Little Caesars carry-out location. Stores in the higher end of the range are typically free-standing buildings, not more traditional strip center locations. Of course, costs vary based on a variety of factors. Please see Item 7 of our Franchise Disclosure Document for additional information, including our assumptions. Little Caesars has a long history of giving back to the communities where we do business, and where there is a need. The Little Caesars Love Kitchen and the Little Caesars Veterans Program are reflections of that business philosophy. The Little Caesars Love Kitchen was established in 1985 to provide quality meals to people in need. The big-rig pizza kitchen travels across the United States and Canada, meeting the needs of the hungry, the homeless and disaster survivors. The Little Caesars Love Kitchen has fed more than two million people in 48 states and four Canadian provinces. Also exemplifying our strong tradition of giving back is the Little Caesars Veterans Program. The program provides qualified, honorably discharged veterans with a business opportunity to become a Little Caesars franchisee when they transition to civilian life or seek a career change. A variety of people, from investors to autoworkers, are making the choice to invest in Little Caesars. They are making their dreams of being their own boss a reality. Contact us today to learn more about joining Little Caesars and becoming part of a dynamic company that is outpacing the industry. *Based on 2011 U.S. store growth. **“Highest Rated Chain-Value for the Money” based on a nationwide survey of quick service restaurant consumers conducted by Sandelman & Associates, 2007-2011.